Animal shelters provide an essential and beneficial social service, caring for an estimated 9 million pets each year in the United States. Many animals entering a shelter are highly stressed and lack the benefits of standard veterinary care, including vaccinations. Moreover animal shelters are an intensive housing situation that amplifies the transmission of infectious diseases (Pesavento and Murphy 2014). Consequently shelter staff devote a lot of time and resources to cleaning and disinfection, in addition to providing animal care. Architect George Miers of Swatt Miers Architects has designed and built many animal shelters on the West Coast. In this video, he discusses some of the considerations that go into designing a new animal shelter. If you are like me, you will be amazed by the amount of attention paid to drain design and power washing. Is there a better way to disinfect animal housing areas? Would UV be a better alternative to chemical disinfectants? Animal shelters are built environments with an important and under-appreciated microbiology and there are many unanswered questions. 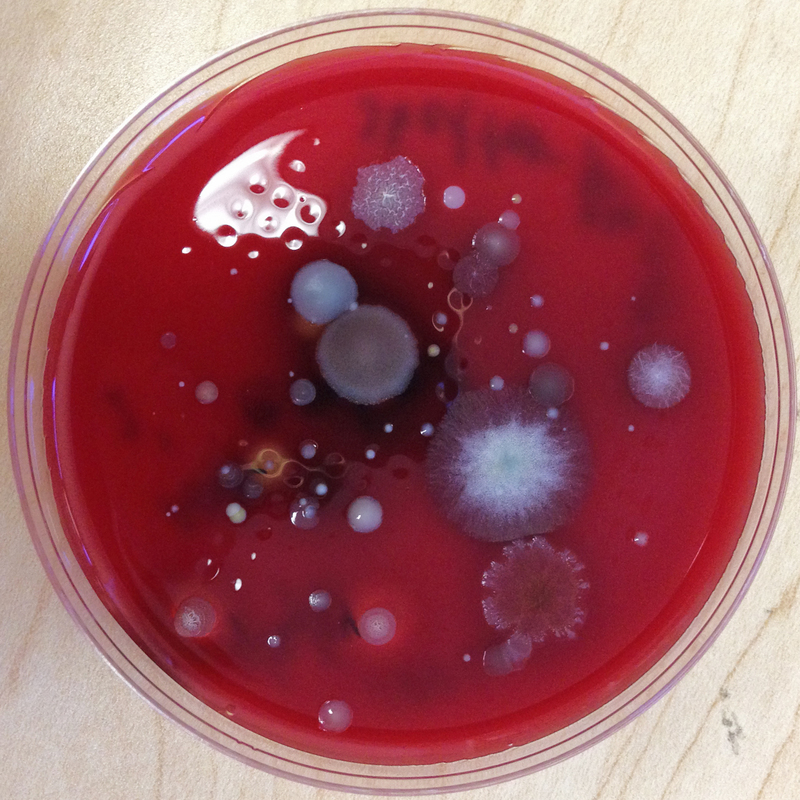 As part of a very preliminary study, we sampled the air in a walkway adjacent to the dog kennels in a local shelter using a Petri dish air sampler to provide a pretty picture of the diverse and abundant bacteria and fungi found inside animal shelters. Sample from kennel walkway, 100 L air sampled, 44 hour incubation. This is pretty! What is the media? I see some fungi in there, no? Can’t be… these plate only grow up microbes. Yes, fungi are in there too. I am sticking my tongue out at you, David Coil. As much as the bacteria microbial ecologists don’t want us to be in the club, we are.